Last spring we were lucky to have Kestrels nesting in our Barn Owl box at the end of the lambing barn. It was great to see them and we were delighted that they reared 4 chicks, but we’d really hoped that the box would attract a Barn Owl. We occasionally see Barn Owls locally but I’ve only seen them twice at the farm, so I was very upset to find one flapping in the road at the end of the farm drive, as we went out one evening a couple of weeks ago. It had been hit by a car, not uncommon as Barn owls are so light that they are frequently drawn into the path of traffic by the air currents created by fast moving cars. I stopped and picked him up, wrapping him in my jumper, to avoid his talons. As luck would have it, George, who is our falconer for the summer Sheepdog and Falconry Displays, was visiting. I handed him the Barn Owl and asked ‘ Do you think that you can mend him? George examined him, and fortunately there appeared to be no obvious injuries, his wings were certainly intact. 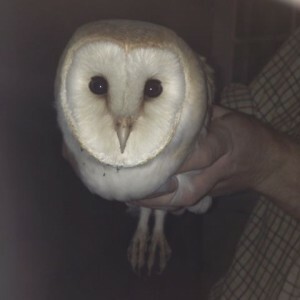 George has a Barn Owl of his own, so I’ve seen them close up before, they are the most stunningly beautiful birds, rows of sandy brown plumage flecked with white running down their backs. it’s such a shame that they are a species that have seen such a decline in numbers. We put him in the coolest room of the house, in a dog transport box, and left him quietly. In the morning the Owl was laying on it’s side and we would have feared that it was on it’s way out, but George assured us that Barn Owls will play dead when in fear of a predator. George supplied some dead mice to feed him, and the first sign of improvement was when, a day later he ate the mouse left for him. For the next couple of days he ate 2 mice a day. On the fourth day he must have been feeling better, as when George moved him out of his box, he hopped back inside. So on the sixth day George decided that he needed the chance to fly, as if he was left confined for any longer he’d stand the chance of losing his wing muscles. We took him to the upstairs of the old stone barn, it’s completely disused, and although it’s not completely bird proof, we blocked the worst of the holes and shut the outside door. Amazingly, as I opened the door he hoped out and without hesitation flew that length of the barn. We left him in peace, and checked on him a few hours later, but on searching the barn there was no sign of our injured Owl. We can’t be sure, but we think that he’d flown successfully away. He was only a short distance from where he was found, and so should be familiar with the surroundings. 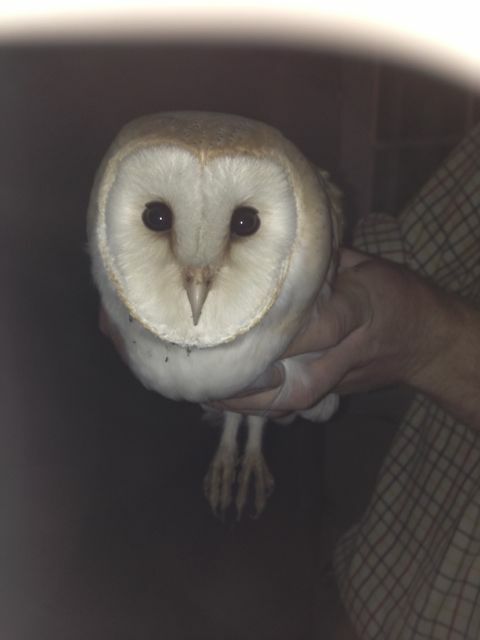 I’ve not seen a Barn Owl since, but when I do, I’ll definitely believe that it is our rescued Owl.